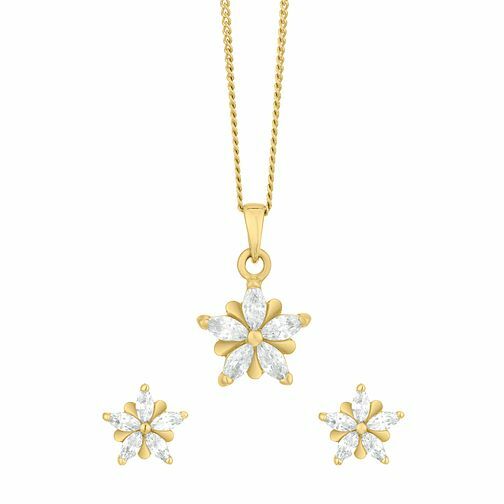 A fabulous floral design, this co-ordinating stud earring and pendant set is a delightful pairing for any outfit or occasion. Made from yellow gold plated silver, an attractive flower is proudly presented with sparkling Cubic Zircona petals. A pretty and perfect pairing. The pendant is 18" in length. Gold Plated Silver Cubic Zirconia Earrings & Pendant Set is rated 5.0 out of 5 by 1. Rated 5 out of 5 by Anonymous from Necklace and earrings I bought these for my daughter for Christmas and she loved them. Just as nice as in the illustration and very good quality.